I'm excited to announce that educational simulation pioneer Clark Aldrich has signed-on to present at the next Second Life Future Salon. The Salon will take place on Thursday, May 26th, beginning at 5:30 PM PST. Two others will join Clark, to be announced later in the week. 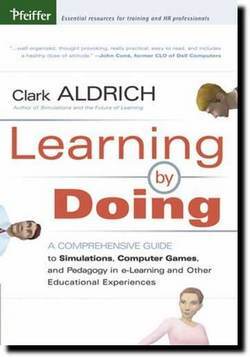 Clark's brand new book, "Learning by Doing: A Comprehensive Guide to Simulation, Computer Games, and Pedagogy in e-Learning and Other Educational Experiences" has just hit Amazon.com. You can also check out his talk from last year's Accelerating Change conference right here, hosted by IT Conversations. Clark is co-founder of the e-learning company SimuLearn, and was lead designer of Virtual Leader, the first educational simulation to have the development cycle of a modern computer game. His other books include "Simulations and the Future of Learning: An Innovative (and Perhaps Revolutionary) Approach to e-Learning". Last Salon, Jim Purbrick spoke about Second Life as an accelerant for research in digital worlds applications (download the audio here). We'll have to see what Clark thinks about SL as a platform for prototyping interactive learning experiences. Amazon.com description of "Learning by Doing": "Designed for learning professionals and drawing on both game creators and instructional designers, Learning by Doing explains how to select, research, build, sell, deploy, and measure the right type of educational simulation for the right situation. It covers simple approaches that use basic or no technology through projects on the scale of computer games and flight simulators. The book role models content as well, written accessibly with humor, precision, interactivity, and lots of pictures. Many will also find it a useful tool to improve communication between themselves and their customers, employees, sponsors, and colleagues. As John Coné, former chief learning officer of Dell Computers, suggests, "Anyone who wants to lead or even succeed in our profession would do well to read this book."" Continue reading for Clark's bio. Clark Aldrich is the co-founder of SimuLearn and the author of Learning by Doing: A Comprehensive Guide to Simulations, Computer Games, and Pedagogy in e-Learning and Other Educational Experiences and Simulations and the Future of Learning. He recently lead the international team that created SimuLearn's Virtual Leader, the first ever learning experience to follow the development cycle of a modern computer game. Virtual Leader has been featured on CNNfn, on CNet, in The New York Times, and in U.S. News and World Report, and it has been sold to some of the largest enterprises in the United States. The simulation is currently being translated into other languages. SimuLearn became an Eduventures 100 company in 2003. Aldrich speaks, writes, and does consulting work on e-learning issues. He authors the popular monthly "Industry Watch" column for Training magazine, and Jossey-Bass published his book Simulations and the Future of Learning, which outlines a new philosophy of immersive e-learning, in September 2003. Aldrich also co-developed, chairs, and keynotes the E-learning Supplier Summit, which is affiliated with the annual Online Learning Conference. In February 2002, Aldrich was listed as one of the 20 people to watch in the Lifelong Learning Market Report. In 2001, the American Society of Training and Development identified him as one of nine members of Training’s New Guard. In 2000, he was chosen as one of three e-learning "gurus" by Fortune magazine and was named one of Training magazine's 16 visionaries of the industry. Aldrich previously worked for Gartner Group, where he was the research director responsible for creating and building the company’s e-learning practice. In this position he developed strategies with Global 1000 organizations, vendors, and venture capitalists and published more than 40 research notes. Prior to joining Gartner, Aldrich worked for almost 8 years at Xerox, where his responsibilities included special projects for the executive office. Aldrich earned a bachelor's degree in artificial intelligence and cognitive science from Brown University. Look's like it will be another good one! Shame about the time though, I thought the plan was to hold future Future Salon's at more Euro friendly early Sunday afternoon slots? >I thought the plan was to hold future Future Salon's at more Euro friendly early Sunday afternoon slots? You're right, Jim. The Thursday date was chosen to meet the needs of May's Salon speakers. We'll have to hop-skip to get the Salon on a Sunday cycle, maybe starting mid-June. Let me think about this. Right now I'm thinking maybe we'll do two Salons in June... Don't quote me on that, though. As a member, you can enjoy a discount as much as 12%, when your purchased gold reach certain amount. You can enjoy priority when we dealing with orders. Fast delivery and high quality is alway promised! Better service for you is our permanent pursuit! Inoltre il corpo di replica Gucci handbags della replica è stato provato all'più alto codice categoria decorativo che lucidasse e denunzie la vostra natura allineare appena come quelle originali fanno. gsczmixcohalrdonabuacdidgiq, Amazon Deals, ctjsrcaaf, http://acsystem-sn.com/>Amazon Deals, yIZobxcqw, http://acsystem-sn.com/ Amazon Deals, djFgkhdmq, Amazon Coupon, oxXjbBfHV, http://mon-boucher.com/>Amazon Free Gift Card, RrQIWzsUr, http://mon-boucher.com/ Amazon Coupon, AGluZlSvR, Amazon Discount Code, xwVxbHVGO, http://bloggertheme.net/>Amazon Discount Code, BHTkBivMo, http://bloggertheme.net/ Amazon Discount Code, hgLlppusv, Amazon">http://property-loan.org>Amazon Discount Codes, YODpIdbfD, http://property-loan.org/ Amazon Discount Codes, UmTqWMNem, Amazon Christmas, cUKUxcmny, http://rosaceaforums.com/>Amazon Christmas, SHHPQMYOc, http://rosaceaforums.com/ Amazon Christmas,NzBecjxBY, Pregnancy Calendar, HiQfamlKT, http://pregnancysymptomssigns.net/>Pregnancy Early Symptoms, QqygraOry, http://pregnancysymptomssigns.net/ Pregnancy Signs, HrOMxmSEu.